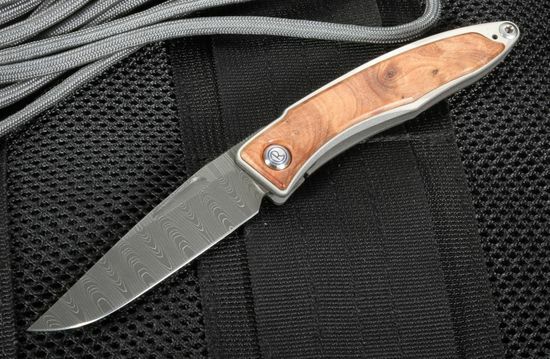 The Mnandi with Thuya and Ladder Damascus is an exquisite folding knife from designer Chris Reeve. Reeve's Mnandi line features more "dressed up" pocket folding knives, representing your personal class and taste whether you're at the office, the bar, or the dinner table. 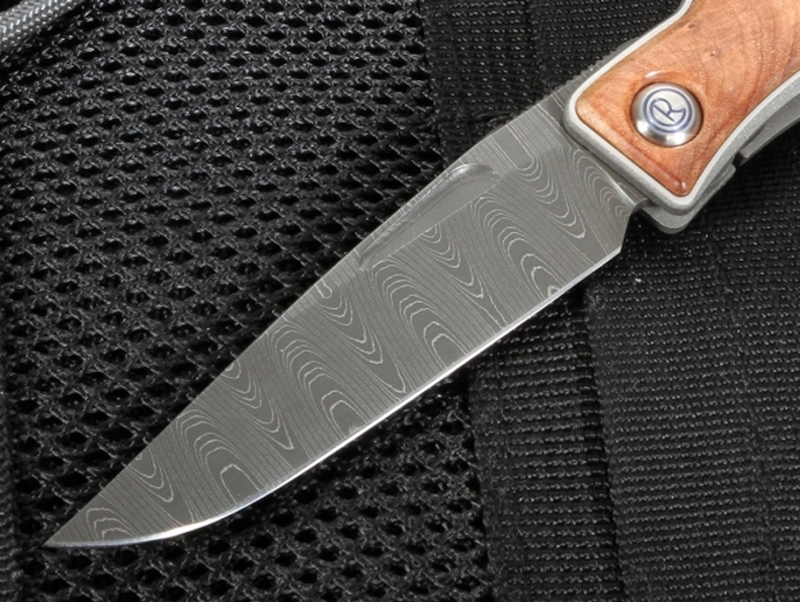 Built with precision in Boise, Idaho, the 2.75-inch stainless Damascus steel blade features an elegant and unique ladder pattern designed by Devin Thomas. Devin Thomas's Damascus steel carries a worldwide reputation for being the cleanest, most precise, and best performing Damascus steel in the cutlery industry. 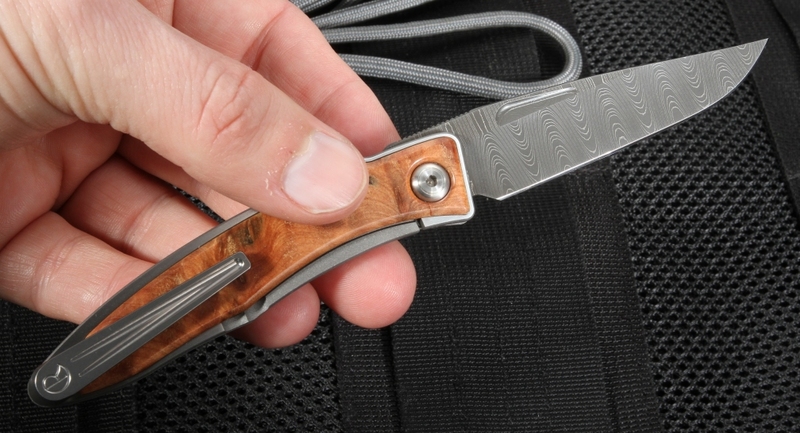 The Mnandi Thuya and Ladder Damascus folding knife offers elegance that can't be beaten by other traditional pocket folding knives. Every knife in Chris Reeve's Mnandi line features your choice of the highest quality exotic hardwood inlays. Thuya wood is an elegant hardwood native to North America and East Asia, and is prized for its exceptional beauty, light weight, and resistance to decay. 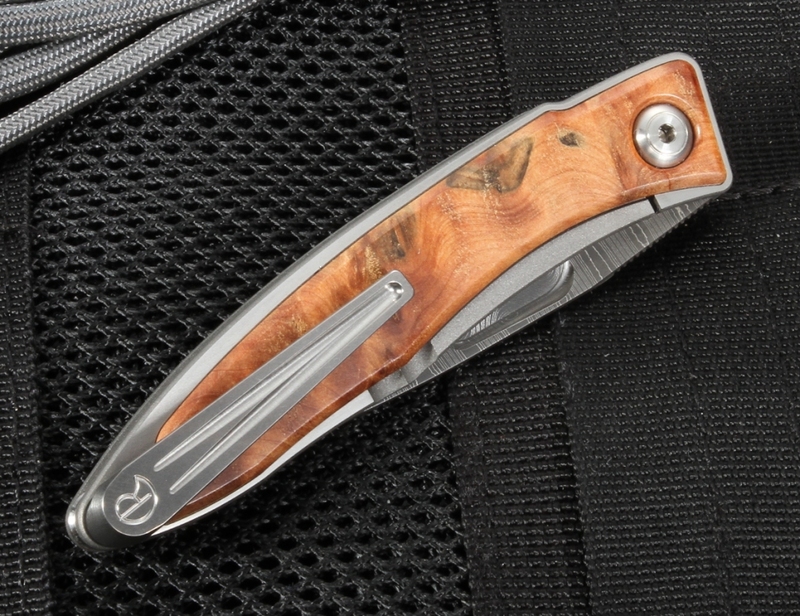 Crafted from the finest Thuya wood and coupled with satin fished 6Al4V titanium flats, the handle of the Mnandi Thuya and Ladder Damascus is elegant, beautiful, and sturdy. With a sleek, machined 6Al4V titanium clip and overall weight of only 1.5 ounces, the Mnandi Thuya and Ladder Damascus can be carried easily and comfortably in a pants pocket or waistband, a shirt or coat pocket, or used as a classy stylish tie clip. The Mnandi Thuya and Ladder Damascus comes equipped with a slim brown calfskin leather slip case, ideal for pocket or purse carry. KnifeArt.com offers free same business day shipping and hassle-free exchanges on our selection of the best knives and tactical products. Chris Reeve's Mnandi Thuya and Ladder Damascus is selling fast, grab yours today at KnifeArt.com! FRAME: Titanium - satin finished flats and blasted contours. ...not a tool-like gem. Luxurious and drool-worthy but sturdy and useful. Lovr the blade profile. Got the replacement screw from CRK, which is necessary if you want to use this knife without the pocket clip. Interestingly, the blade is more perfectly centered with the screw in place than as shippe with the pocket clip. Anyway, this is a perfect light EDC/"dress" knife that will not cause any stares or screams (though maybe some oohs and ahhhs). I have a small insingo in S35VN and wanted to go all the way, so I got the beautiful, but not crazy-busy ladder damascus. The snakewood inlays are very snakelike, with beautiful figuring on both sides. This is surely a once in a lifetime purchase for me. Opening can be done slowly with just the thumb due to the "grip" provided by the damascus, but for me it is not a flipper. Easier to open by pinching the thumb nicks on both sides with thumb and index finger and finish opening with thumb (I am right handed), but can do same deliberate "pinch" opening with left hand. This arrived in 2 days frm KnifeArt, to New York State. I like having an appropriate pocket knife on me at all times, and this will be used for those special occasions.